Blink and you’ll miss it – if you are looking for a farm community in Saskatchewan. I watched carefully for a small sign for Laura -one of hundreds of shrinking villages in Saskatchewan. To find Nettie Wiebe on her farm she’d said to cross the tracks at the old (& decommissioned) United Church – she couldn’t tell me to look for the grain elevator because it was destroyed in 1996, gone along with the post office, schools, local shops and services that were supported by small farmers. Those who still live in Laura have to go to Delisle, 18 kilometres away, for basic services. I found the Wiebe- Robbins farm, bustling with activity; it looks prosperous and thriving The large comfortable home the couple built in the early 80s is well cared for, the tree belts and fertile garden are set in 925 of acres oats, clover, peas, wheat flax and 2300 acres of pasture and hay for cattle food. The look is deceptive; both Nettie and her husband, Jim Robbins, work off-farm to maintain the farm, their family and their commitment to farm life. When I arrived the organic inspector was also visiting – checking on the presence or possible use of chemical fertilizers, herbicides and pesticides. He told me he checks for the presence of weeds – a sure sign that herbicides are not being used. That’s a problem, as Nettie explained. Farmers drive around and look at each other’s fields; they consider the presence of weeds seed an embarrassing sign of a poor farmer. But with the new knowledge, “that industrial farming and chemicals are not environmentally sustainable” Nettie and her husband overcame the traditional aesthetic and cultural problem and faced the transition to organic for 3 years. Those may be lean years, but organic certification means a major saving on chemicals and seeds, and a higher price for crops which compensate for lower overall yields. And for the woman who calls herself “an agrarian feminist”, the passion of caring for the land and producing healthy food is part of her passion for the future of the family farm. Curled up in a big chair, the slim, youthful mother of four, talks with animation and warmth while she pokes her finger in her cheek and laughs. The daughter of Mennonite farmers whose parents came to Canada seeking religious freedom for their pacifist faith, Nettie has always loved farm life. She was born in Warman and grew up on a farm with 8 sisters and 6 brothers; she is the 12th child of parents that flourished in their co-operative community and saw interdependence as strength. Her faith was tested early. In 1975, Warman was chosen by Eldorado, the federal crown agency for nuclear development, to be the site of a uranium treatment facility. The decision caused a split in the town as well as in families. Older Mennonites from a patriarchal tradition believed the reassurances of the experts and government. Business saw a chance for prosperity. Some sold land for good prices. Younger Mennonites and women, like Nettie, saw the issue as one of social responsibility and health, an integral part of their faith – a faith based in action not talk. The struggle cause many hard feelings, Nettie’s home was a focus of the activism. In the end, Eldorado changed their plan because of the opposition. Nettie’s father was shaken by the dispute; he had a heart attack and left the farm. Nettie is a philosopher – she studied the work and though of Immanuel Kant – to her ideas are as real as people, she loved the intellectual reward of understanding knowledge, empiricism and truth. She now teaches at St. Andrew’s College at the University of Saskatchewan. Self-described as high-energy, she worked on the farm, had two small children, did her school work after midnight and managed to get her PhD in 1983 from Calgary when pregnant with a third child. Family and farm life was her dream, Nettie always loved domesticity. She sees no problem reconciling an intellectual life with that of domesticity; in fact they complement one another. Like most family farmers, Nettie and Jim work off-farm because crop prices are low and costs, and expenses, particularly those, petroleum-based, are increasing rapidly. Nettie taught philosophy off and on for years at the University of Saskatchewan. She was a low paid sessional lecturer when she was refused a tenured position, in spite of her impressive credentials; she believes it was because she was a woman. Then one day the National Farm Union came calling. She responded to the visitor with: I’ve been waiting for you! The collective sense of responsibility and the values of rural life that the NFU embraces were just what Nettie was waiting for. She was ready and her life took a new turn. She became active in the NFU and was soon the Women’s President. Early in 1990s she went with farm women to Nicaragua to see first hand rural life and farm conditions in the majority world. The NFU established solidarity links with women in UNAG, the farmer union there. In 1993 she was co-founder of Via Campesina, an international farmers’ organization with 80 groups in 40 countries. Via Campesina has been very effective in raising farm issues globally and has contributed to the stalling of trade negotiations and international agencies. The globalization of all aspects of life recalls the results of a favourite slogan: AFTA NAFTA: THE SHAFTA. 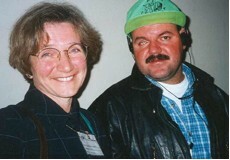 Nettie’s leadership skills, based on her ability to reconcile and cooperate soon led to becoming the first woman to be President of the NFU, 1995-1998, and Via Campesina co-ordinator for the Canadian organization. Nettie has always had a strong women’s support group that she credits for her success in changing the attitude of male culture within and without NFU. She says she used a classic Mennonite response to conflict – saying you may be right sometimes but not always in larger picture. Even in our discussions, I could see her impressive ability to make connections between all issues and viewpoints to build a common ground for action. Although she can be critical of the NDP, particularly in Saskatchewan, Nettie decided to try the political path without expectation of perfection. Ever the philosopher, she says “One cannot allow the perfect to be the enemy of the good.” Nettie has been a NDP candidate several times. She and her running mates failed to be elected; in the last two federal elections, Saskatchewan turned to the right. Farmers and workers with memories and bonds to the idealism of the CCF are decreasing in numbers. The individualism of neoliberalism has its effects in Canada as in the rest of the world. Nettie continues to be active in the NDP at the constituency level. She says, “Government is the lever of power we have to make change – and we need to try to be part of it. Social movements do have power to change society and its values, but we cannot have justice without power/ power without justice. She believes they can be integrated. Since 1998 Nettie has taught philosophy at St. Andrew’s Theological College of the University of Saskatchewan. She takes seriously her role in educating important members of the community, future ministers and pastors, in ethics and social justice. She says that, “The Church can transform, but the Church has to change”. The college is a place “to re-imagine the world” and help students “to re-evaluate the status quo”. It is also a place to ask questions which provoke wider and deeper thinking – a discipline of enquiry that challenges conventional thinking using philosophical methods to analyze, to facilitate enquiry, to put life in a moral context; all that can make “radical transformation” possible. Nettie will be representing Via Campesina in meetings again and she is writing some of her experiences while on sabbatical from St. Andrew’s and she is active in politics locally. She is concerned about new initiatives from the new Conservative government. She is especially troubled about the fate of the Canada Wheat Board, an agency legislated to market grains abroad for Canadian farmers. The present government is trying to undermine the WB’s monopoly. Nettie fears that it will be whittled away at and then parliament will change the Act, breaking the monopoly and destroying the WB’s ability to provide farmers market security. She’ll be joining actions organized to publicize these dangers and to save the Wheat Board. She feels what she sees as realistic pessimism about the increasing difficulties of family farming. She says, “Pessimism also creates some necessary humility about our ability to make change”. Her nature certainly leans to optimism and she balances doubts with the pleasure of her full life. She continues to be “optimistic about our possibility of transformation to make a better world” which is an expression of her faith. “She is a true Mennonite”, as her daughter says. Nettie too is aware of the controlling power of chemical companies. She says, “Now we face GMOs with which corporations want to control key crops, destroy diversity and maximize corporate profit. Globalization and its values have changed attitudes about our culture (Cheaper is better). The biggest issue for farms here is continued concentration of power by controlling corporations. We are hostage to a view of agriculture that is a reductionist model of increased production. We are struck with development propaganda – industrial farming that does not consider the effect on the ecology. The Green Revolution, leading to chemical farming wore out the soil.” Nettie’s view of agriculture is more complex because it combines people, community, land and society. And if we think about it – that should be the view of all farmers and citizens. I have never visited a prairie home in the summer without being taken to see the garden. So, as I leave, Nettie proudly shows off the rows of thriving vegetable and fruit rooted in rich black soil, her elaborate water saving system and the promise of shared food and feasting – the ultimate reward and joy of farm life. She waves good-bye with a big smile and I leave, smiling back at her and I think: you can’t keep a woman down on the farm now that she’s seen the globe and globalization; you just can’t keep a good woman down.